Nicky Walker has challenged Boston United to force their way into the play-offs. 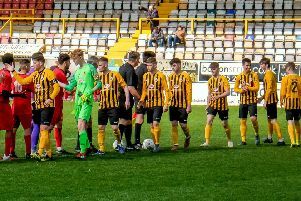 The Pilgrims ended Saturday a point outside of the top-seven following their 2-1 win over FC United. And as they head to basement boys Nuneaton Borough on Saturday, the winger is keen to move higher up the table. “We’ve put ourselves in a good position,” he said. “We’re one point off. We’ve played a few extra games but I’d rather be up there than have games in hand. “I think over the last five or six results, since the new year, we’ve not done too bad apart from the odd game. But Walker admits that Nuneaton will be no slouches. He added: “They’ve got nothing to lose. We’ve got to respect Nuneaton just the same.